This is the third competitive renewal for this grant from the National Heart, Lung and Blood Institute of the National Institutes of Health. The diabetes-related research was initially funded in 2005. Diabetes is the seventh leading cause of death in the United States. About 29.1 million Americans, one out of every 11 people, have diabetes, a disease in which blood glucose levels are above normal. Diabetes can cause serious health complications, including heart disease, blindness, kidney failure and lower-extremity amputations, according to the Centers for Disease Control and Prevention. The grant will help Zou determine if adenosine monophosphate-activated protein kinase (AMPK), an essential energy and redox homeostasis sensor, maintains the balance of mitochondrial fission and fusion by promoting the autophagic degradation (the natural, destructive mechanism of the cell that gets rid of unnecessary or dysfunctional components) of dynamin-related protein 1 (DRP1). The findings could lead to a new treatment for diabetic vascular diseases. Mitochondria are the power houses of cells, and a disruption in the balance between mitochondrial fusion and fission is associated with mitochondrial dysfunction in a variety of diseases, including neurodegenerative and cardiovascular diseases. Zou’s preliminary data found that inhibiting AMPK is accompanied by increases in mitochondrial fission, oxidative stress and endothelial dysfunction. “The completion of this study will assess whether the inhibition of mitochondrial fission, a crucial step in the initiation of cardiovascular disease, can be a new strategy to protect against the development of vascular disease in diabetic patients,” Zou said. The project has two aims. Zou’s research team will determine the essential role of AMPK in maintaining the balance between mitochondrial fission and fusion, and they will explain the molecular mechanisms by which AMPK inhibits DRP-1-dependent mitochondrial fission in endothelial cells, which line the inner walls of blood vessels and lymphatic vessels. The studies will be conducted in mice. An abstract of the grant, 5R01HL080499-12, is available at NIH’s Project RePORTer website. BOTHELL, WA and ATLANTA, GA -- (Marketwired) -- 04/24/17 -- On April 20, 2017, Cocrystal Pharma, Inc. (OTCQB: COCP) (the "Company") closed on proceeds of $3,000,000 in a private placement offering (the "Offering") of 12,500,000 shares of the Company's common stock at a purchase price of $0.24 per share. The purchasers included one of the members of the Company's board of directors, Chairman Dr. Raymond F. Schinazi. In addition, OPKO Health, Inc. invested in the Offering, of which the Company's director Dr. Phillip Frost is Chairman and Chief Executive Officer. Cocrystal is a clinical stage biotechnology company. The Company has completed human clinical safety profiling of its pan-genotypic non-nucleoside hepatitis C virus (HCV) polymerase inhibitor (CC-31244) in healthy subjects and has completed enrollment in a trial in HCV infected subjects. The drug appears to be safe and well tolerated in both healthy and HCV-infected patients. HCV-infected subjects treated with CC-31244 had a rapid and marked decline in HCV RNA levels, slow viral rebound after treatment, and no viral breakthrough during treatment. Results of this study suggest that CC-31244 could be an important component in an all-oral limited duration HCV combination therapy. The Company's influenza program has a lead compound and several other promising preclinical candidates under development. The lead compound CC-42344 showed excellent antiviral activity against various influenza A strains, including avian pandemic strains and Tamiflu resistant strains. "It is an exciting time at Cocrystal as we continue to advance our science programs and clinical trials. We are grateful for the continued support of our dedicated staff and investors in helping us to achieve our goal of developing promising and novel antiviral pharmaceuticals," stated Dr. Gary Wilcox, Cocrystal Pharma's interim Chief Executive Officer. Cocrystal is a clinical stage biotechnology company seeking to discover novel antiviral therapeutics as treatments for serious and/or chronic viral diseases. Cocrystal employs unique technologies and Nobel Prize winning expertise to create first- and best-in-class antiviral drugs. These technologies, including our nucleoside chemistry expertise and market-focused approach to drug discovery are designed to efficiently deliver small molecule therapeutics that are safe, effective and convenient to administer. The company has identified a promising clinical stage compound and preclinical stage antiviral compounds for several unmet medical needs, including hepatitis, influenza and norovirus infections. Cocrystal has previously received strategic investments from Teva Pharmaceuticals, OPKO Health (NYSE: OPK), Brace Pharmaceutical, LLC, and The Frost Group. For further information about Cocrystal, please refer to www.cocrystalpharma.com. The Advanced Technology Development Center, Georgia’s technology incubator, has named Michael Maziar investor relations manager. Maziar, who had been chief operations officer of Atlanta Technology Angels, will manage ATDC’s Investor Connect program and its related activities, as well as develop and maintain relationships with angels, venture capitalists, and other sources of debt and equity financing for ATDC’s portfolio companies. As Atlanta Technology Angels’ COO, Maziar oversaw its day-to-day operations. His role included managing the deal flow process going from recruiting and screening through the due diligence phase. Additionally, he was responsible for angel investing education, managing the analyst program, and entrepreneurial and membership support. Prior to that, he worked throughout the Atlanta startup technology ecosystem in sales, marketing, and operations. In 2016 he joined as a partner at the Guild a residential co-living accelerator for change makers and social enterprises based in Atlanta’s East Lake neighborhood. Maziar earned his MBA from Georgia Tech’s Scheller College of Business and obtained his bachelor’s degree from the University of Colorado. In his spare time, he volunteers on various nonprofit boards, including Startup Atlanta, and advises various other social entrepreneurs and civic innovators. Atlanta biotech firm GeoVax Labs Inc. (OTCQB: GOVX) reported Tuesday it has raised $1 million by selling shares to an unidentified investor in a private placement transaction. In the stock sale, GeoVax sold 1,000 shares of its Series D Convertible Preferred Stock which is initially convertible into 66,666,667 shares of its common stock. Robert T. McNally, GeoVax’s president and CEO. The news came a day after GeoVax said it has made progress in each of its vaccine development programs. GeoVax said May 8 it has obtained "very impressive preclinical results (100% protection) for our Zika vaccine from a highly rigorous lethal challenge model conducted by the Centers for Disease Control and Prevention (CDC)." GeoVax also said it's initiated a new clinical trial for its preventive HIV vaccine for the developed world. 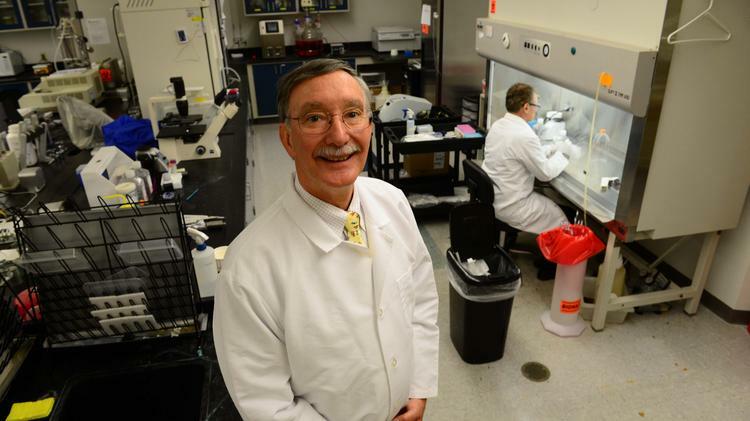 The company was recently awarded a $658,000 grant from the National Institute of Allergy and Infectious Diseases to continue its work toward another HIV vaccine for the developing world. GeoVax also recently initiated a new program to develop a malaria vaccine through a collaboration with The Burnet Institute in Australia. GeoVax has also been working on vaccines for Ebola. CENTER VALLEY, Pa. and RADNOR, Pa., May 5, 2017 /PRNewswire/ -- Avantor, a global supplier of ultra-high-purity materials for the life sciences and advanced technology industries, and VWR (NASDAQ: VWR), the major global independent provider of product, supply chain, and service solutions to laboratory and production customers, today announced that they have entered into a definitive agreement under which Avantor will acquire VWR for $33.25 in cash per share of VWR common stock, reflecting an enterprise value of approximately $6.4 billion. The purchase price represents an approximate 17% premium to the unaffected closing stock price on May, 2, 2017, the day prior to the start of market speculation regarding a potential sale of VWR. The purchase price also represents an approximate 20% premium to the 30 trading day volume weighted average price (VWAP), and an approximate 24% premium to the 90 trading day VWAP of VWR common stock as of May 2, 2017. Avantor's acquisition of VWR will create a major consumables-focused solutions and services provider to the high-growth life sciences and advanced technologies industries, as well as education, government, and research institutions across the globe. The acquisition will build on each company's strengths, including Avantor's cGMP manufacturing processes, significant exposure to emerging markets and VWR's significant position across the Americas and Europe. The combined company will be a vertically integrated organization, serving a global customer base in all areas of their activities, from research through production - a unique advantage in a fast growing marketplace. Michael Stubblefield , Chief Executive Officer of Avantor, said, "Avantor's acquisition of VWR is both highly compelling and complementary. We will bring together our well-known expertise in ultra-high-purity materials and customized solutions with VWR's global scale, unparalleled channel access, and deep customer relationships. Collectively, this will create a larger, stronger and more diversified company with significantly enhanced scale and product breadth. The global customers that we plan to serve in a more high-touch manner will immediately benefit from the combination, as we will provide end-to-end solutions that offer increased quality, effectiveness, and productivity." Mr. Stubblefield continued, "Avantor and VWR share a dedication to enabling the advancement of science worldwide and a commitment to quality, safety, innovation and customer service. Both of our companies have highly qualified employees who are dedicated to helping our customers succeed. We look forward to welcoming VWR's more than 10,000 employees to Avantor and to our continued success as one team upon the successful completion of the transaction. We expect that this acquisition will expand opportunities for our employees, as part of a larger, high-growth enterprise." Manuel Brocke-Benz , President and Chief Executive Officer of VWR, commented, "Since our IPO, VWR has made significant progress executing on our strategy to drive organic growth, and the first quarter 2017 results that we will announce today clearly show that VWR's growth story remains on track. Given the changing dynamics in the highly fragmented and diverse life sciences sector, we believe that combining Avantor's advanced materials and solutions with VWR's unparalleled distribution capabilities and breadth of offerings represents a compelling value proposition. I am confident that this acquisition will create a highly differentiated organization, one that is uniquely positioned to serve the growing needs of laboratory and production customers around the world." Matt Holt , Managing Director at New Mountain Capital, said, "We believe this combination creates significant value for all stakeholders including customers, partners and the employees. The combined company will have a strong position as a vertically integrated, global player in manufacturing and supply chain solutions for the life sciences, advanced technologies, and research industries." The agreement followed the unanimous approval by the Board of Directors of both VWR and Avantor. Completion of the transaction is subject to the expiration of a "go-shop" period, the expiration or termination of the applicable waiting period under Hart-Scott-Rodino Antitrust Improvements Act and European Commission approval, obtaining any required clearance, consent or approval under applicable foreign antitrust laws, VWR shareholder approval, and other customary closing conditions. Varietal Distribution Holdings, LLC, the largest shareholder of VWR comprised of, among other parties, Madison Dearborn Partners (MDP), which has been a significant shareholder of VWR since 2007, and certain officers and directors of VWR, has signed a voting and support agreement committing it to vote in favor of the transaction, representing approximately 34.8% of the total issued and outstanding shares of common stock of VWR. Following the closing of the acquisition, which is expected in the third quarter of 2017, New Mountain Capital will be the lead shareholder of the combined company, and MDP will not own any shares of common stock of the combined company. The combined company will be led by Mr. Stubblefield upon closing. Goldman Sachs, Jefferies LLC, and Barclays are acting as financial advisors to Avantor, and Simpson Thacher & Bartlett LLP is serving as legal advisor to Avantor. BofA Merrill Lynch is acting as exclusive financial advisor to VWR, and Kirkland & Ellis LLP is acting as legal advisor. Fully committed financing of the acquisition has been provided by Goldman Sachs, Barclays, and Jefferies LLC. VWR will report its first quarter 2017 financial results on May 5, 2017. In light of the announcement of VWR's definitive agreement with Avantor, VWR no longer plans to provide or update financial guidance and will not hold the investor conference call on its first quarter 2017 results, previously planned for 8:00AM ET on May 5, 2017. Avantor's product portfolio includes more than 30,000 products that meet increasingly stringent standards across technology driven and highly regulated markets. Avantor manufactures and markets its products around the world under several respected brand names. Avantor's brands of performance chemistries include the J.T.Baker®, Macron Fine Chemicals™, Rankem™, BeneSphera™, Puritan Products™, and POCH™ brands. Avantor's brands of advanced silicones include the NuSil™ and CareSil brands. For more information visit www.Avantorinc.com. VWR (NASDAQ: VWR), headquartered in Radnor, Pennsylvania, is a global independent provider of product and service solutions to laboratory and production customers. With sales in excess of $4.5 billion in 2016, VWR enables science for customers in the pharmaceutical, biotechnology, industrial, education, government and healthcare industries. With more than 160 years of experience, VWR has cultivated a value proposition delivering product choice, operational excellence and differentiated services to improve our customers' productivity from research to production. VWR's differentiated services provide innovative, flexible and customized solutions from scientific research services to custom-manufactured chemical blends. Our dedicated team of more than 10,200 associates is focused on supporting scientists, medical professionals and production engineers to achieve their goals. For more information on VWR please visit www.VWR.com. Madison Dearborn Partners, LLC (MDP), based in Chicago, is a leading private equity investment firm in the United States. Since MDP's formation in 1992, the firm has raised seven funds with aggregate capital of approximately $23 billion and has completed approximately 130 investments. MDP is currently investing out of its most recent fund, $4.4 billion MDCP Fund VII, in businesses across a broad spectrum of industries, including health care; basic industries; business and government services; consumer; financial and transaction services; and telecom, media and technology (TMT) services. For more information, please visit http://www.mdcp.com. Statements about the expected timing, completion and effects of the proposed transaction and all other statements in this press release, other than historical facts, constitute forward-looking statements within the meaning of the safe harbor provisions of the Private Securities Litigation Reform Act of 1995. Readers are cautioned not to place undue reliance on these forward- looking statements and any such forward-looking statements are qualified in their entirety by reference to the following cautionary statements. All forward-looking statements speak only as of the date hereof and are based on current expectations and involve a number of assumptions, risks and uncertainties that could cause the actual results to differ materially from such forward- looking statements. The parties may not be able to complete the proposed transaction on the terms described above or other acceptable terms or at all because of a number of factors, including (1) the occurrence of any event, change or other circumstances that could give rise to the termination of the merger agreement, (2) the failure to obtain shareholder approval or the failure to satisfy the closing conditions, (3) the failure to obtain the necessary financing arrangements set forth in the debt and equity commitment letters delivered pursuant to the merger agreement, (4) risks related to disruption of the attention of Avantor's and VWR's managements from their respective ongoing business operations due to the proposed transaction, and (5) the effect of the announcement of the proposed transaction on the ability of each party to retain and hire key personnel and maintain relationships with its customers, suppliers, operating results and business generally. Actual results may differ materially from those indicated by such forward-looking statements. In addition, the forward-looking statements represent the parties' views as of the date on which such statements were made. The parties anticipate that subsequent events and developments may cause their views to change. However, although the parties may elect to update these forward-looking statements at some point in the future, they specifically disclaim any obligation to do so. These forward-looking statements should not be relied upon as representing the parties' views as of any date subsequent to the date hereof. VWR and certain of its directors, executive officers, and certain other members of management and employees of VWR may be deemed to be participants in the solicitation of proxies from shareholders of VWR in favor of the proposed merger. Information about directors and executive officers of VWR is set forth in the proxy statement for VWR's 2017 annual meeting of shareholders, as filed with the SEC on Form DEF 14A on March 31, 2017. Additional information regarding the interests of these individuals and other persons who may be deemed to be participants in the solicitation will be included in the proxy statement with respect to the merger that VWR will file with the SEC and furnish to VWR's shareholders.